PLEASE READ: THE 22 WINCHESTER AUTO IS NOT THE SAME AS THE 22 LONG RIFLE or a WINCHESTER MAGNUM! One Box of 50 Cartridges : 22 Winchester Auto, newly made for the Winchester Model 1903 semi-auto rifle, loaded with 45 grain lead projectile. $24.99 per box for Five boxes (Save $25.00 over box price) SALE! $19.99 per box for Ten boxes (Save $100.00 over one box price) SALE! Please Note: single cartridges for collectors are available , please see below in related items. 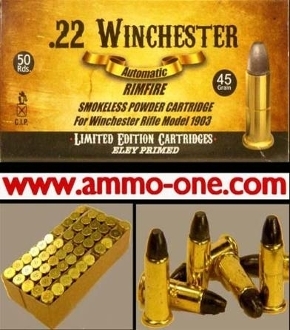 THE 22 WINCHESTER AUTO IS NOT THE SAME AS THE 22 LONG RIFLE or the WINCHESTER MAGNUM! THIS CARTRIDGE WILL NOT CHAMBER IN THE 22 LONG RIFLE FIREARM! Returns for ordering wrong ammunitiion is subject to a 30% restocking fee and no refunds on shipping cost! History of the .22 Winchester Auto Cartridge: The 22 Winchester Auto or a.k.a. 22 Win. Auto was introduced in 1903 for the Winchester Model 1903 Semi-Auto Rifle. The rifle has not been produced since 1937 and Winchester stopped making the cartridge in the 1970s. The purpose of the cartridge was to prevent action-gumming of black powder ammunition in a semi-auto rifle. Remington and others also made the 22 Winchester Auto cartridge, but the "22 Remington Automatic Cartridge" and 22 Winchester Auto are different cartridges and the two are NOT interchangeable.